Valletta is the capital city of Malta – the smallest country in the European Union. It is named after Jean Parisot de Valette, the 49th Grand Master of the Order of Malta, who commissioned the construction of the city starting in 1566. Like most grand projects in the past, the creator never managed to see the completion of the project because he died before it could be completed. Valletta and its flat roofs are still around today, and the city remains the capital of Malta. In this game, players take on the role of builders, helping to construct the buildings of this new city as well as enlisting the aid of notable townsfolk. The buildings in the city are made up of three types, each with its own color. A certain distribution of these cards is drawn based on the number of players, and then these are dealt out in rows of 5 on the table, alternating being above and below the street board which lies in the center of the table. In a 4p game, there are 30 cards total, so there will be 3 rows of 5 cards above the board and 3 rows below the board. Near the bottom right of each building is found a letter, and this will tell you which matching small card to put on top of the building card. The purple Jean Parisot de Valette meeple is placed at the top of the street board; barrel tokens are placed on every space on the Valette track. Each player takes the 8 houses in his color as well as a starting deck of 8 cards and a single starting good. These cards are shuffled and a hand of five cards is dealt. There is space on each player’s board for the rest of the deck to rest. The bulk of the player board is devoted to three spaces for cards to be played. On a turn, players choose three cards from the hand, placing them on the board one at a time and executing the action of each card as it is played. The rules are quite specific that you can’t pass on your turn – you must play three cards. Once you have played the cards and resolved their effects, the three cards are placed onto the discard pile area on the right. Then, you draw cards from your deck to bring you hand up to five cards. If there are not enough cards in your deck to fill your hand, take the whole deck, then shuffle your discard pile to create a new deck, and continue to draw until you have five cards in your hand. 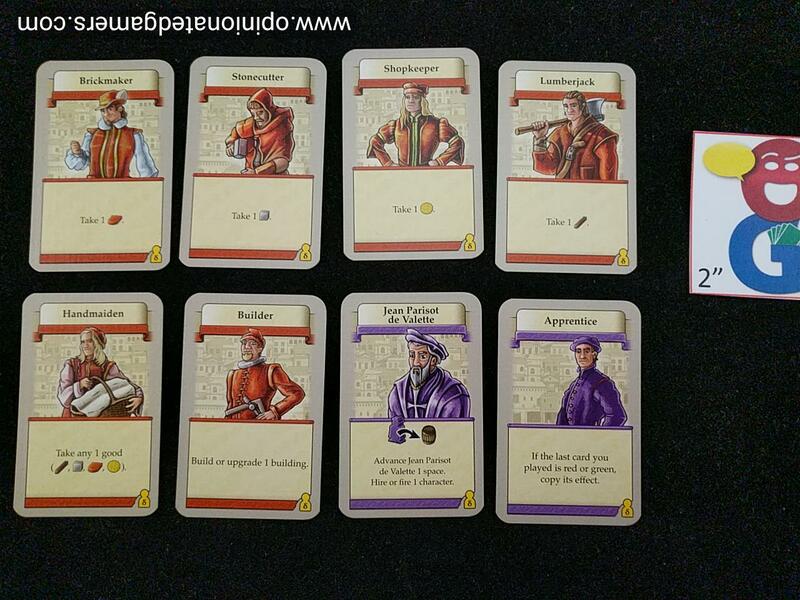 The Red (starting) action cards allow you to gain goods while others allow you to build a building. Buildings are the way to improve your deck of cards. When you build a building, you pay the cost of any unbuilt building – the cost in resources is found in the upper left of the card. You mark the building card with your color house to show that it is built and you take the smaller card from the building card and add it to your hand. The building card remains on the table. It has a VP value in the bottom right which you will score at the end of the game. It also has some icons in the bottom left corner which are used by other character and building effects. Note that you get a discount on building next to other buildings that you own. For each directly orthogonally adjacent building, you reduce your cost by one gold coin. The street blocks all adjacency. Also, if you do not have the right combination of goods, you can trade in any 3 goods for any other – but only may do this while directly paying for a cost. Finally, look and see where the purple figure of Jean Parisot de Valette is. If his figure is in the column where you are currently building, you score an immediate 2VP bonus for building there. Speaking of Jean Parisot de Valette (JPdV) – each player has a card for him as well. When you play this card, you move JPdV one space forward on the track. You reveal the barrel token that was on that spot and take the matching good shown on the back of the token. Then you can either fire a character card, taking that card OUT of your hand and placing it in the discard area on the table OR you can hire a character card from that same area and add it to your hand. The game starts with four extra Builder cards in the discard area, and the composition of that pool will change as players fire cards from their deck. It is also possible to upgrade an existing building – to do this you pay the cost of the building again EXCEPT you do not have to pay the gold cost. When you pay the resources to the supply, turn the building card over. It now has a higher VP value, and it may have additional icons shown in the bottom left corner. 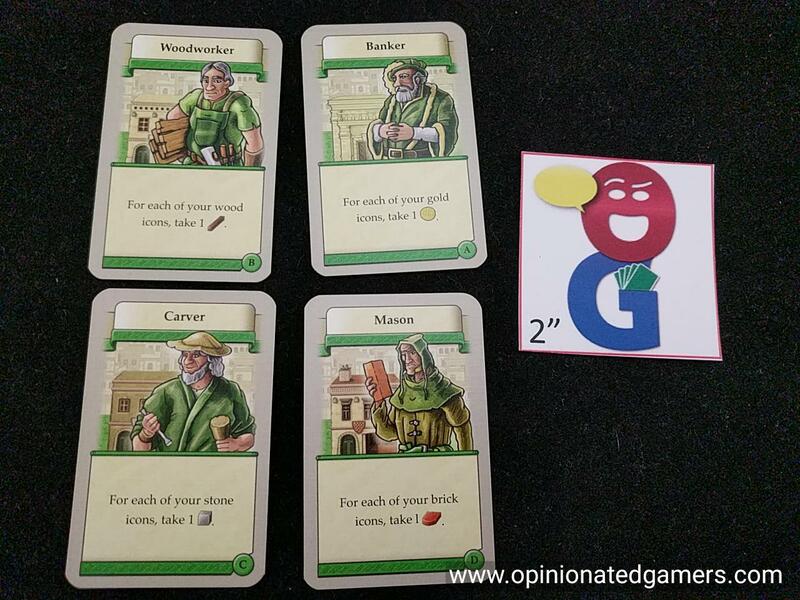 The Green action cards let you take multiple goods based on the buildings that you have already built. Depending on which variety you play, you essentially count up the number of icons of the specified type found on all of your building cards on the table and then collect resources of that type equal to that number. There are varieties for all four goods: coins, bricks, stone and wood. The blue action cards are a bit more complex. Some let you build or upgrade buildings at a discount. Others force your opponents to give you coins or goods. Others let you convert one type of good to other(s). The final color of cards are the yellow action cards. These represent important people involved in the building of the city. Each of these allow you to score victory points in some manner. Again, the exact composition of the cards is determined by random draw. Depending on the number of players, you will shuffle and pick out some of the cards of each color. Then, once the cards are chosen, they will all be shuffled together to give a different layout of cards each time on the table. When this happens, the player who triggered any of the final phase conditions finishes his turn (which includes drawing up to five cards in his hand. Then, ALL players shuffles their current deck and discard pile together to form a final deck. Play continues around the table until all players have played all of their cards. The discard pile is never reshuffled at this point. As you near the end of your deck, you may not have enough cards to draw up to 5, at this point, you simply draw all you can. You may also have a turn where you cannot play 3 cards because you do not have that many left; when this happens, you simply play all the cards that you have. At the end of the game, players score the board and their remaining goods. You look at each of your houses on the table and score the number of VPs shown on the card where that house lies. Then, you score 1VP per every 3 goods that you have at the end of the game. The player with the most points wins. Ties go to the player with the most houses. 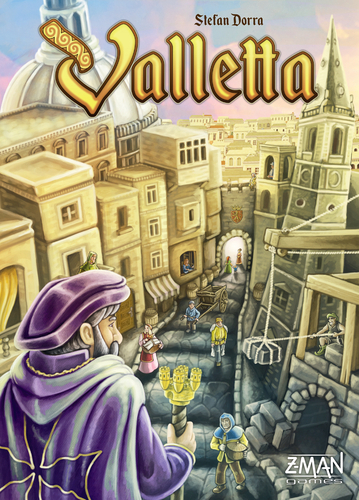 Valletta gives the player a wonderful mix of tactical card play, a little bit of deckbuilding, and a decent dose of resource management. For me, this all combines to create an engrossing game. Right from the start, the game requires players to do a bit of advanced planning. I’m a big fan of this “Turn Zero” strategizing where you get a chance to survey a game’s layout and try to develop a plan right from the start. As I mentioned earlier, the distribution of cards is going to be a bit different in each game, and because of this, the relative value of cards can vary quite a bit. Trying to figure out which ones are better values or better suit your strategy is important to work out before the game really starts. Then, once you’ve decided upon which cards you’d like to target, taking adjacency bonuses as well as the potential location of the purple JPdV meeple also may help you figure out what things you’d like go for from the get-go. This varied setup also plays a large role in the replay value of the game. As I have played the game, I have definitely become more familiar with the different cards and how they work, but I find that this Turn Zero puzzle continues to make each game a unique challenge. As with most deckbuilders, there is a high possibility/probability of promos and/or expansions to breathe new life into the game by adding in new buildings/cards with novel actions. 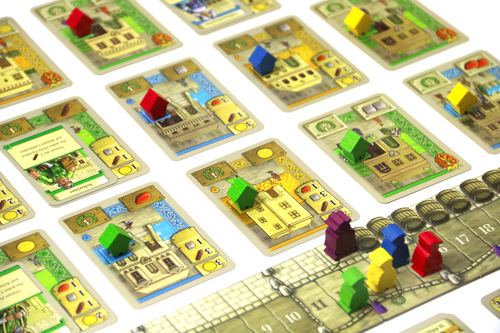 The game starts out in a predictable fashion in the first few rounds as most players will try to gather resources in order to buy their first building. In this game, when you buy a building card, it goes directly into your hand, which means you can use the new action as soon as you buy it! No waiting here for your discard pile to be shuffled. What this means is that it is often possible to have powerful turns happen, sometimes in unexpected fashion, by gaining a card and then immediately using its power to your advantage. All of the card powers are fairly straightforward, and it is easy to explain the powers on them by focusing on each color separately. The artwork is clean, in the distinctive style of Klemens Franz. The icons are easy to see, and the card layout is easy to parse. My only quibble with the components is the split rulebook. Having seen this system in a number of games over the past year, I can easily say that I am definitely not a fan of this style. There is a tri-fold page which gives you the setup (cleanly illustrated and numbered) as well as the general flow of the rules. Then, there is a stapled 8 page book that is called a “Card Reference”. However, there is way more than just card explanations here – there are lots of actual rules to the game contained within. For me, this organizational system makes it harder to find things when I’m looking for them. That being said, the rules format did not prevent me from learning the rules nor being able to teach it to others, so it’s definitely not a deal breaker. The game usually moves along nicely, though there are certain times in the game where it simply stops as a player has to search the board and his hand to try to find the optimal order of cards to play for something good to happen. From my experience thus far, I’d say that this happens maybe two or three times per player per game. Otherwise, given the incremental nature of your actions, it often takes four to six cards to reach your next objective (building) – and thus some of your turns go quite quick – especially if you’re just gathering resources. You should always be keeping an eye out on what your opponents are collecting, and you should always be working on a backup plan just in case an opponent pips you to a particular building card that you were working to get. Larry (4 plays): This is the level of deckbuilding I like. More straightforward than Dominion (at least, for me), but still challenging, with a goodly number of decisions to be made. It also plays quite quickly. One nice thing is that there are a number of different approaches which can work: going for new territories, going for upgrades, thinning your deck, rushing the game to its conclusion, and so on. It makes for a very nice package. This is one of my favorite Dorra designs and he’s been at this business for a very long time. Jeff (1 play): I have always admired Dorra for his clean designs and interesting-but-not-overwhelming mechanisms, and this one is no different. It is easy to learn, quick to play, has plenty of interesting decisions and rewards experience (the only player in our game who had experience with the game schooled the rest of us). It has great variability, tension, and room for clever–and big–moves as Dale pointed out, but I fear that it may not have enough flashy new mechanics or gimmicks to get it noticed as much as it deserves. I’m certainly happy that someone brought it to my attention. Dan Blum (2.5 plays): I don’t think this will ever get up into “love it” territory, but I like it. It feels distinctly different from other deckbuilding games, which I consider a plus (not knocking all deckbuilding games, but if it feels like Dominion, why not just play Dominion?). Craig M. (2 plays): I enjoyed my first two plays, but like Dan, I don’t have a strong desire to seek out opportunities to play the game, but I won’t turn a game down. I generally really enjoy games from Stephan Dorra, but this was just rather so-so. It does feel different than other deck building games, but the excitement just isn’t there. 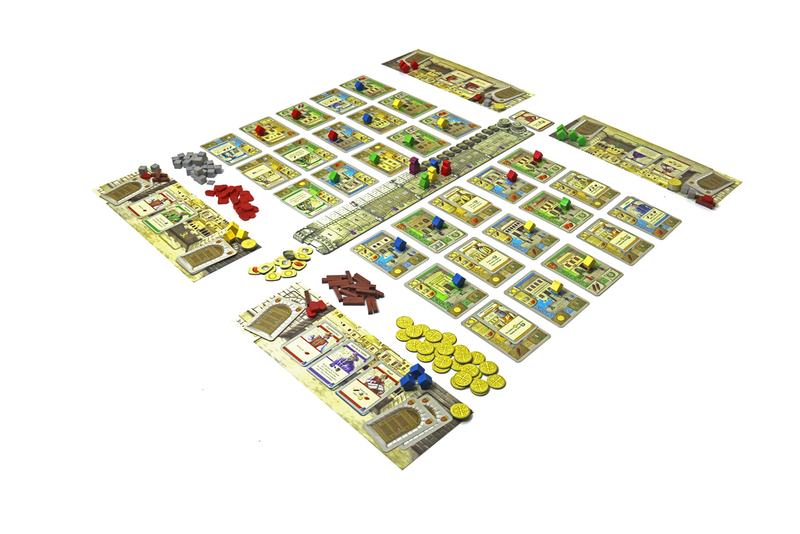 Patrick K. (2 plays): I found myself feeling like I was in a bit of a Eurogame ‘time warp’ while playing this – the level of complexity and rules density is very similar to many ‘golden age’ Euros from about 1995 – 2005. 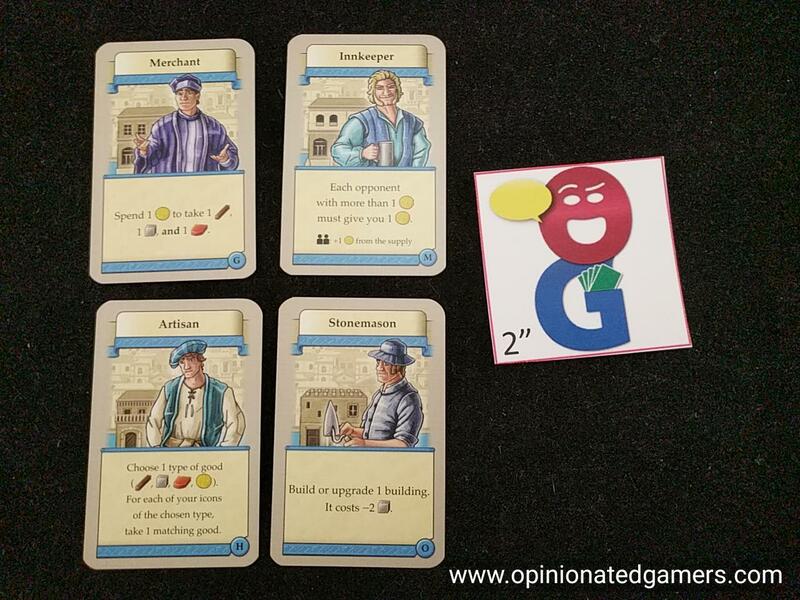 The game is a little bit similar to Lorenzo in that you’re acquiring cards to hopefully run an efficient engine – but Lorenzo feels far more rules-heavy and complicated. 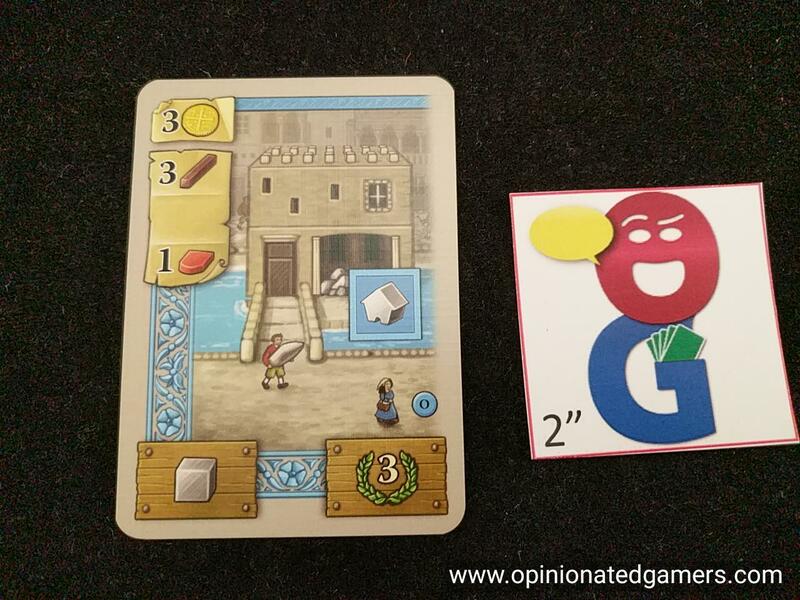 So as more of an introductory Eurogame, Valetta has something to offer. Where I differ from Dale’s opinion, though, is in the replay value – the decisions didn’t feel interesting enough to make me want to put a lot of effort into making better ones. It’s fine for what it is, but I don’t see it rising above ‘fine’ for me. 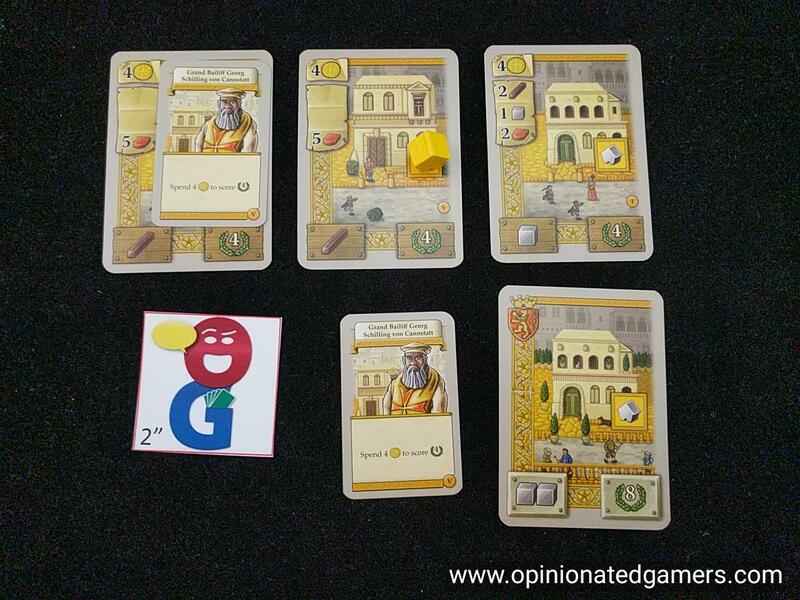 Simon Neale (2 plays): I have enjoyed my plays of Valletta as there are interesting choices to be made especially around whether to advance your boat to be first into a new area or to maximise your opportunities in the current area. The mechanics work smoothly and the game lasts about the right amount of time for its depth. Neutral. Lorna, Craig M. Patrick K.